The chief of Army Staff, Lt.-Gen. Tukur Buratai, on Thursday said the Army is in top gear to end insurgency in the northeast and the country at large. Buratai made the assertion during the fire power demonstration and closing ceremony of the sixth edition of Exercise Vulcan Glow organized by the Nigerian Army Corps of Artillery at Kachia, Kaduna State. Buratai was represented by Maj.-Gen. Hakeem Okiti, the Commander, Army Infantry Corps. The Army chief said the exercise was part of the Army’s resolve to remain well trained and focused in the discharge of its constitutional duties. “This is more so, at a time when the nation and the military is on top gear in addressing security challenges most especially Boko Haram terrorists and other criminal activities bedevilling our nation’s territory,” he said. “This exercise which is an annual event will continue to be used to provide the needed training for NACA personnel towards improving their competence and that of the NA in general.” he said He noted that artillery Corps has not restricted itself to its conventional roles, but has keyed into efforts to combat other contemporary security challenges and military operations other than the war being prosecuted by the army. “This was aptly captured in the exercise setting which has taken cue from the experience and lessons learnt from on-going operation in the North East and other operation theatres across the country. 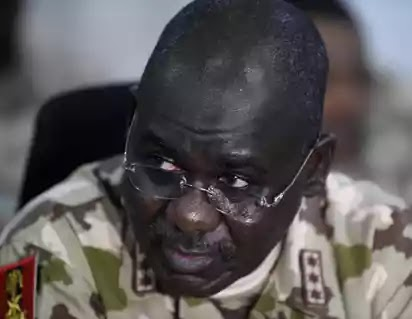 Group slams anti-Buratai campaigner over missing ex-Army officer “I expect that pragmatic and innovative lessons will come out of this exercise for the benefit of the Nigerian Army,” Buratai added. Earlier the Commander, Artillery Corps, Maj.-Gen. Abubakar Tarfa said the exercise is an artillery concentration exercise conducted to practice proper planning, preparation, employment and deployment of artillery resources in all phases of conventional and unconventional wars. Tarfa said this year’s exercise provided an avenue for the Army leadership to confirm the corps preparedness in carrying out its roles in line with the vision of the Chief of Army Staff of having a professionally responsive Nigerian Army. The exercise which begins on November 11, brought together five artillery brigades from Minna, Akure, Bauchi, Owerri and Ogun. The 34 artillery brigade Owerri emerged overall winner, while 32 artillery brigade Akure came second and 33 artillery brigade Bauchi was third.